Heat oven to 350°F. In a large bowl or stand mixer, beat cream cheese and sugar together until smooth. Add yogurt; beat until smooth. Add eggs one at a time, mixing until well incorporated. Finely crush 2 Oreo™ cookies and stir into the cream cheese mixture. Line a 12-cup muffin tin with parchment cupcake liners. 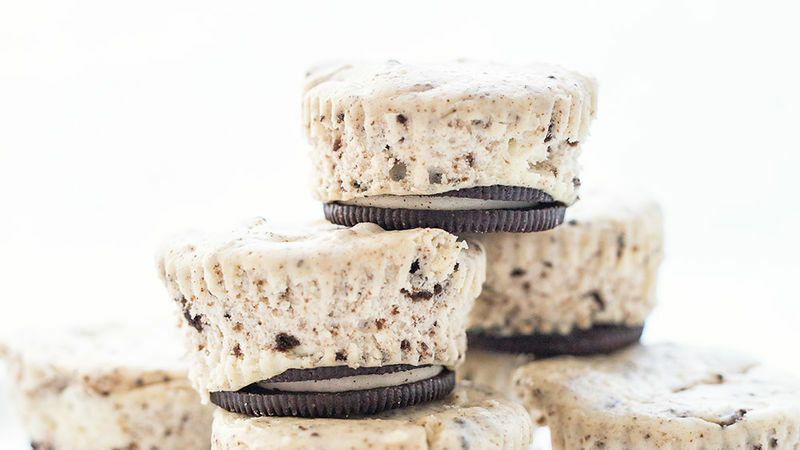 Place an Oreo™ cookie in the bottom of each muffin cup and top each with a scoop of the cream cheese mixture. Bake for 23 minutes, or until the centres are set. Cool completely before serving. Important: Be sure to follow the recipe instructions and mix the cheesecake filling ingredients in stages as described above. If you mix all the ingredients together at once, the batter will be lumpy.